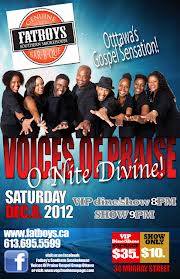 VOP Annual Christmas Concert : “O Night Divine II” A night of soulful, high energy gospel for the Christmas season. VIP Dinner Package, $35 and includes premium seating, cover and $25 food/beverage voucher. Concert only $15. VIP Tickets/Reservations at Fatboys, 613-695-5599 or www.fatboys.ca click calendar or events or visit Fatboys or Voices of Praise Ottawa on Facebook. Gospel Brunch Sunday featuring VOP! CONCERT: Caridad Cruz with the Miguel De Armas Quartet. 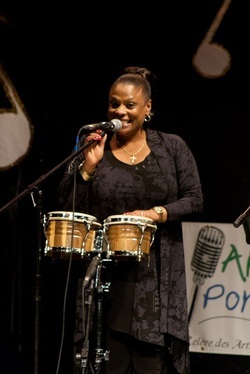 Steeped in Afro-Cuban culture from an early age and with a formal musical education in her native country, Caridad Cruz made a career as a principal singer in Cuba’s tourist hotels and night clubs for more than a decade, until marriage brought her to Canada in late 2003. Her Canadian musical debut the following spring was broadcast nationally by the CBC and her “warm ocean of a voice” was applauded in the Globe and Mail. Since then she has excited and mesmerized audiences with her own special mix of salsa, Latin jazz, and traditional Cuban songs, in Toronto, Montreal, New York and all around Ottawa. MDA Latin Jazz Quartet: Miguel De Armas – piano; Michel Medrano – drums; Arien Villegas– congas; Marc Decho – bass. Also: Carmelo Scaffidi – trumpet; César Ricardo – vocals. Tickets: starting at $25. ORDER BY PHONE: 1-888-991-2787. Beres Hammond, The King of Lovers Rock, in Gatineau, Qc - August 16, 2013! 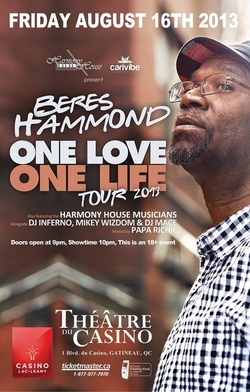 CONCERT: BERES HAMMOND ONE LOVE ONE LIFE TOUR 2013! singer-songwriter, Beres Hammond’s beloved hit-filled repertoire, amassed over the past 40 years, is also rife with songs that simply, yet with profound effect, articulate the commonalities of life’s struggles and triumphs, irrespective of one’s class or creed, race or religion. dancehall superstar Mavado have name checked Beres in their songs. downtown Kingston’s record shops to mingle with the era’s popular singers including the late Bob Marley and Peter Tosh. At a precocious 11 years old Beres recorded his first single for producer Clancy Eccles, which, unfortunately wasn’t released until he became a star some 20 years later. Beres initially attracted attention with his victories at the Merritone Talent competitions in the early 1970s. In 1975 he joined the fusion band Zap Pow as lead singer, remaining with them for four years while simultaneously pursuing solo recordings. His debut solo album, the aptly titled “Soul Reggae” released in 1976 sold well throughout Jamaica while a subsequent single released the same year, the soulful ballad “One Step Ahead”, zoomed to the top of the Jamaican charts where it remained for three and a half months. Hammond formed his own record label, Harmony Records, in 1985 for the release of his Make a Song album, which had two Jamaican chart-toppers that were influenced by the emerging dancehall style: "Groovy Little Thing" and "What One Dance Can Do". 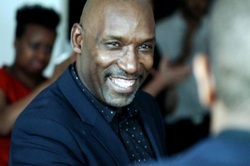 The latter, produced by Willie Lindo, began to break Hammond into the international market. He scored another hit in 1986 with "Settling Down" on his eponymous release. His 1987 hit “What One Dance Can Do” elicited a string of hit answer records including Beres’ own “She Loves Me Now”; released at the dawn of reggae’s digital revolution, both songs reached the national tally in England and established Beres’ stardom on the dancehall reggae circuit. Even farther-reaching acclaim arrived in 1990 when Beres laid his vocals over a sumptuous synthesized rhythm created by Penthouse Records founder Donovan Germain. The singer barely remembers recording “Tempted to Touch” in 1992 but the song nonetheless shot to the top of reggae charts in Jamaica, the US and in England. Twenty years on Beres has improbably maintained his hit-making streak and continues his reign as Jamaica’s most esteemed singer. Welile Nxumalo is an Ottawa-based rising singer/songwriter whose musical background draws from the Soul, RnB and jazz genres. With her strong Swazi heritage and her passion for music and performance, she honed and practised her craft while pursuing university studies. During such a transformative time, music became an exciting journey of self-discovery for her, as well as a form of restoration. She lives her life inspired by liberating and honest song lyrics and quotes. Some of her inspirations are community leaders and artists in soul and jazz genres such as Miriam Makeba and now expanded her inspirations to current world artists like John Legend, Lira, Ella Fitzgerald, Kellylee Evans, Christina Aguilera and many more. She is currently developing her instrument and some music writing with other fellow musicians. 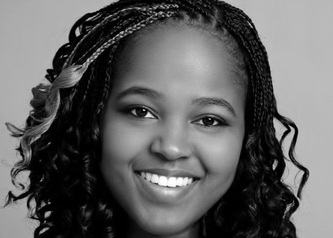 She performs regularly at community events and was most recently featured at the Young Artists’ Showcase presented by the Cathedral Arts in February 2013. Her work is already receiving accolades, including a first place in three performance competitions at the Festival Musique Jeunesse / Youth Music Festival. 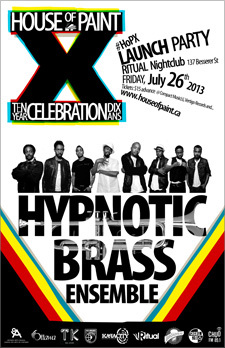 A family band from the South side of Chicago, Hypnotic Brass Ensemble blends the music of hip hop’s roots-- jazz, funk, soul—with an 8-piece brass section that has the presence of an entire orchestra. The 8 brass players, all blood brothers from the south side of Chicago, are sons of legendary trumpet player Phil Coran and have performed with Mos Def, De La Soul, Erykah Badu, Gorillaz, Prince, Tony Allen and members of Wu-Tang Clan. 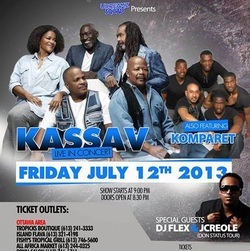 Legendary Zouk band KASSAV in Gatineau on July 12, 2013!! 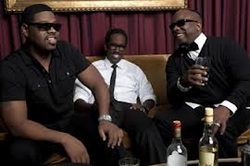 R&B Heartthrobs Boyz II Men in Ottawa April 8, 2013! OFFICE: Lauder Hall, Christ Church Cathedral, 439 Queen Street Entrance OFFICE HOURS: Monday to Friday from 11:00am to 1:00pm. 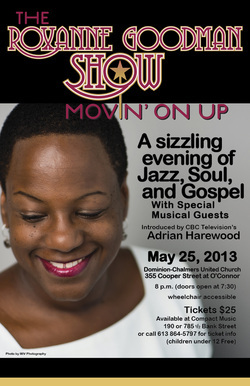 This wonderful event is being hosted by special guest, New York bass, Gregory Sheppard. 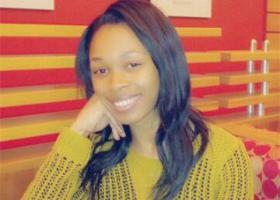 excerpts, Holiday talks about her insecurities and fears as a performer, among other topics. Ortega performs some of the most famous & beautiful bass arias in the operatic canon, including Handel’s renowned “Ombra mai fu”, known to many as the “Largo from Xerxes”. nothing else apart from this magnificent sonata, Kodály would still deserve to be accounted one of the greatest musical geniuses that Hungary has ever produced". It contains influences of Debussy & Bartok, as well as the inflections and nuances of Hungarian folk music. Bryan Cheng will perform in memory of his recently deceased teacher, the late Yuli Turovsky. He will play the last two pieces they worked on together. wings, and in “Deh vieni, non tardar” Susannah sings in eager anticipation of being with her beloved Figaro. Conversely, the Donaudy speaks to the pain that a gentle heart can suffer at the hand of love, while in the famous “Song to the Moon” Rusalka begs the moon to tell her where her absent lover is, that she is waiting for his return, and asks the moon to help him remember about her. Prince: How Come U Don’t Love Me Anymore? known for as a performer. The Bach Partita No. 1 is from a set of six partitas for harpsichord that Bach composed late in his career – however, they were among the first of his works to be published under his direction. 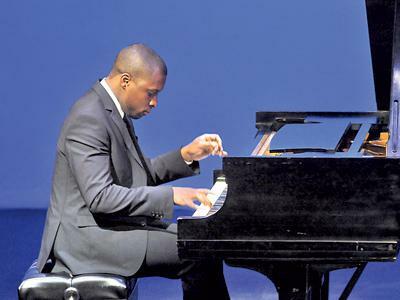 Born in Ghana, Mr. Dapaah is also a talented Jazz player, and shows his versatility in his own arrangement of several well-known songs. • 4- Do you know Him? and Rue refers to "the bitter and the sweet" that comes with life and love and is part of the African American experience. Capturing echoes of such European masters as Mahler and Berg, there a hint of Americana in the Copland-Bernstein vein, and elsewhere the engaging verve of jazz and the blues. When: Saturday, February 16, at 2:00 P.M.
Cathedral Arts Box Office: Christ Church Cathedral Ottawa, Lauder Hall, 439 Queen Street (Accessibility Entrance); Office Hours: Monday to Friday: 11:00 A.M. to 1:00 P.M. Photos, from left to right, Keena Eloise, John Dpaah, Welile Nxumalo. A spirited duet with vocal performances that will take your breath away. Barbara and Kim revisit their musical influences through a repertoire that spans the eras, adding a little humour and plenty of craziness! Expect a serving of “Le pouding à l’arsenic,” “C’est beau un homme,” and a little dash of “Georgia on My Mind,” “Tout doucement” and “C’est si bon.” You’re sure to be captivated! TICKETS: •$28 (adults) •$25 (seniors) •$23 (students) Presented by Ville de Gatineau. Montreal native Kim Richardons was born into a family of talented singers, actors and musicians, including the great Jackie Richardson, her mother. Her first single, "He's My Lover" won her a Juno award for Most Promising Female Vocalist of the Year in 1986. Her second single, "Peek-A-Boo", brought her another Juno for the Best R&B/Soul Recording the following year. 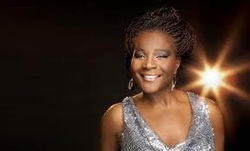 In 1994, after relocating from Toronto to Montreal, the group The Merlin Factor - of which she was the lead singer - won a Juno for the Best Contemporary Jazz Album of the Year and earned a Juno nomination in the same category the year after. 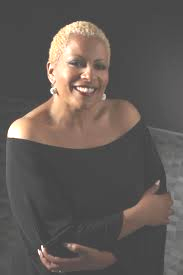 In 2006, Kim released her first solo CD entitled Kaleidoscope – a co-production with blues singer and friend Nanette Workman. Kim’s newest project is that of her new French album, Mes amours. Produced by André Di Cesare (Star.ca) and arrangements by Jeff Fisher, this album brings a new take on some seasoned French songs. Tickets will be held for pick-up on Saturday, December 8; or they may be collected during Cathedral Arts Office Hours. 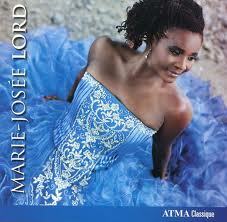 Cathedral Arts's December 8th concert is proudly featuring award-winning Haitian-born soprano, Marie-Josée Lord, who returns to Cathedral Arts by popular demand after her magnificent performance last year, and the Christ Church Cathedral Ottawa Girls’ Choir, directed by the Cathedral’s new Associate Director of Music, James Calkin. debut in 2003, singing Liù in Puccini's “Turandot” at Opéra de Québec. 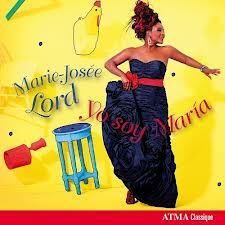 In 2005, Marie-Josée Lord received the Prix d'Excellence de la Culture, awarded by the Fondation de l'Opéra de Québec, and was selected to represent Canada at the Cardiff Singer of the World competition (www.mariejoseelord.com). This past summer, the Christ Church Cathedral Ottawa Girls’ Choir completed a grand performance tour of the United Kingdom and Belgium, which included celebrated performances at Canterbury Cathedral and in Ypres. Mrs. Catherine Chapman, the spouse of Bishop John Chapman, is helping to champion this event. Cathedral Arts is pleased to announce that its Annual Christmas Concert on Saturday, December 8th will serve to raise awareness and provide funds to support the work of Centre 454, an organization that provides drop-in support services for individuals who are homeless or are at risk of homelessness (www.centre454.ca), and The Well-La Source, a Day Program for women and women with children (www.the-well.ca). Playground for Children of all Abilities at Brewer Park; Youth Drug Addiction and Project S.T.E.P. ; and, homelessness. Support this exceptionally gifted Canadian artist by buying her music! 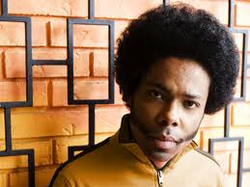 IN CONCERT: Alex Cuba. 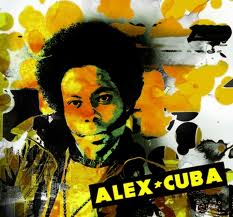 Born Alexis Puentes in 1974 into a musical family in Artemis, Cuba, Alex Cuba, is a Cuban-Canadian singer-songwriter who sings in Spanish and English. He has built a very successful career since moving to British Columbia in the late 1990s. 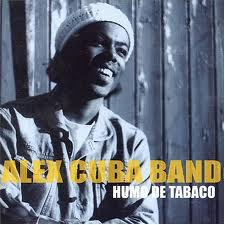 He has won two Juno Awards for World Music Album of the Year: in 2006 for Humo De Tabaco, and in 2008 for his second album, Agua Del Pozo. In 2010 he won the Latin Grammy for Best New Artist. His music reflects primarily Latin and African influences, but with a mix of funk, jazz and pop. Alex is on the vanguard, crafting a cross-cultural sound that mirrors his geographical journey. 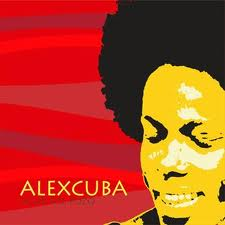 For more info, visit artist website: www.alexcuba.com Tickets on sale now! From $33. Order by phone (TicketMaster): 1-888-991-2787 (ARTS). Purchase in person: NAC Box Office Monday to Saturday 10 a.m. to 9 p.m. at 53 Elgin Street, Ottawa. Support this amazing Canadian artist by buying his music! 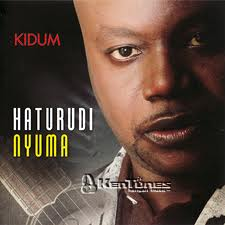 East African R&B sensation Kidum returns to Ottawa August 25, 2012! CONCERT featuring Kidum! Admission: $20 per person and $30 per couple. Meat kebabs will be on sale. Burundian master drummer, composer, arranger and singer Jean Pierre Nimbona, fondly known as Kidum, is a Nairobi-based artist whose infectious tunes have captivated legions of East African fans. In Burundi, Kidum is an icon of hope and reconciliation; in neighboring Rwanda, he is recognized as the ‘homeboy.’ His secular-but-spiritual songs range from rocking zouk to acoustic classics, all featuring his vocal prowess. This talented artist has collaborated with other popular music stars such as kenya's Nameless ("Karibia") and already has 4 albums to his credit: YARAMENJE, SHAMBA, ISHANO and HATURUDI NYUMA. Tune in to "Afrika Revisited" (CHUO 89.1FM, www.chuo.fm) on Saturday, August 25 2012 from 10am to 11am to hear a live interview with this artist! Nambuusi "Rita Carter" Kyeyune (Musician) & Kalid Nour (CEO & President) of RHYTHM AND KAL ENT. “Canada’s Queen of R&B”, Jully Black performs at Canada Day concert on the Hill on July 1st 2012! Canada's R&B Queen Jully Black will be on the Hill for the Canada Day Noon and Evening concerts on Sunday, July 1st 2012! First appearing on the Canadian pop charts in 1998 with the single "Rally'n," Jully Black (born Jully Ann Inderia Gordon in Toronto in November 1977) has several albums to her credit including "This is Me" (2005), "Revival" (2007) and "The Black Book" (2009). commanding yet endearing presence and the ability to create a personal connection with those who witness her in her most favoured element – on stage. A force to be reckoned with, this Canadian-born, triple threat (singer/songwriter/performer) loves to share her talents and has an enthusiasm for music that is unparalleled. Her charming attitude and charismatic personality has helped propel her career and reach milestones that most artists struggle to achieve in a lifetime – winning multiple Juno awards, penning songs for the likes of Nas and Destiny’s Child as well as performing along side artists such as Jay-Z, Sean Paul, Kardinal Offishall and Alicia Keys. Jully's new, soon to be released album, entitled (8)IGHT, boasts a fresh, energetic and soulful sound, something that has been described as “the future of soul”. 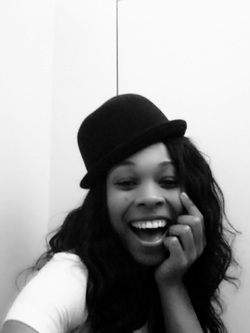 Traditionally, Jully is from the school of R&B, with influences like Whitney Houston and Tina Turner. She has combined these soulful sounds with beats and rhythms provided by Atlanta producer YoungPete Alexander and the creative writing and arrangement skills of Luther Brown. 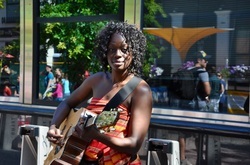 Watch out for Jully's live interview on Ottawa's CHUO 89.1FM, on Saturday, June 30th between 11am and 12pm ("Black on Black")....and support this brilliant Canadian artist by buying her music! Dan Hill is a multiple award winner, internationally renowned author and singer-songwriter. He has been nominated for a GRAMMY for Best Male Vocal, won a GRAMMY (as co-producer of “Seduces Me” on Celine Dion’s 30 plus million-selling “Falling Into You” album), won five JUNO Awards and the Harold Moon Award (Canadian Lifetime Songwriting Achievement Award). Dan has recorded and released multiple gold and platinum albums. (That I could Love)”, another #1 AC record, all remain staples of AC radio stations around the world. 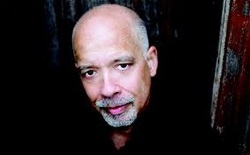 In 2009, Dan Hill published his highly acclaimed memoir, I Am My Father’s Son (HarperCollins Canada). On the heels of completing his memoir, Dan recorded his 14th album, Intimate, his first studio album of new songs in almost 15 years. Sorpano Marie-Josee Lord is back in Ottawa! Make sure to mark Friday, February 24, 2011 at 8 p.m. in your calendar! African Sanctus - Latin and Arabic, Christian and Muslim, Rock and Classical, Acoustic and Electronic, Ancient and Modern - is a celebratory and visionary work, expressing unity between people, their faiths, and their music. 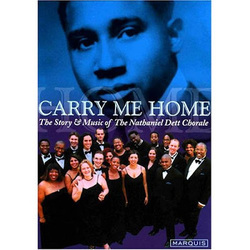 It is an unorthodox setting of the Latin Mass harmonized with traditional African music recorded by the composer on his now legendary journeys up the River Nile. Fanshawe’s taped music from Egypt, Sudan, Uganda and Kenya is heard in counterpoint with the live chorus, soprano soloists and an instrumental ensemble, playing both acoustic and electronic instruments. The full work is composed in thirteen movements and reflects the composer's cross-shaped pilgrimage, from the Mediterranean to Lake Victoria, whereby Kyrierepresents Cairo and Sanctus Northern Uganda. Mike Murley, Saxophone; Mark Kelso, Drums. Africville Stories is a new presentation by Joe Sealy that builds on his 1996 Juno award winning album, “Africville Suite”. 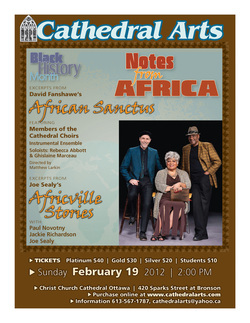 Africville Stories, “a powerful, emotionally resonant fusion of song, narrative and music spanning jazz, classical, blues, rhythm and blues and gospel”, is a poignant combination of words and music that express uplifting stories about the people and their community, the kind that you generally don’t hear when people speak of Africville. it is currently nearing completion on the site of Africville. Its construction is seen as a small step towards compensating the“Africville” community for injustices of the past. Richardson. Joe has presented his full “Africville Suite” in concert halls, universities and music festivals across Canada, Denmark, Norway and the USA. He has enjoyed a highly successful career as a musician, composer, recording artist and radio broadcaster. In December 2009, Joe Sealy was appointed to the Order of Canada for his outstanding contributions to the arts.